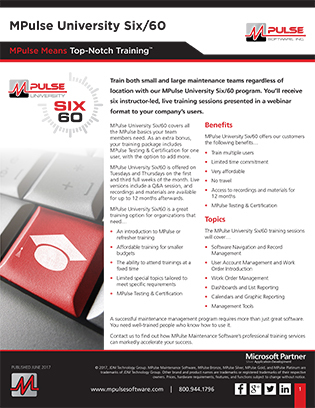 Train both small and large maintenance teams regardless of location with our MPulse University Six/60 program. Recordings and materials are available for up to 12 months afterwards. Contact us to find out how MPulse Maintenance Software’s professional training services can markedly accelerate your success.